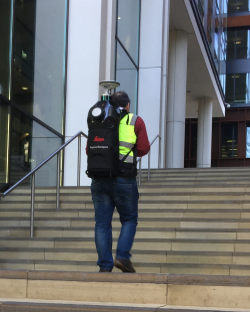 Having recently invested in a Leica Pegasus:Two Mobile Mapping System to extend our existing Street Level mobile mapping service, the Getmapping team were invited by Leica to try out their wearable mobile mapping solution - the Pegasus:Backpack. Whilst the Pegasus:Two system enables the rapid and simultaneous collection of both high-resolution panoramic imagery and high-density point cloud data from a moving vehicle, the backpack offers a portable platform to collect data indoors, outdoors and underground. The system is typically suited to areas that are inaccessible to the Pegasus: Two system but reachable by foot – such as pedestrianised areas, transport concourses, shopping precincts, underground infrastructures and car parks. Equipped with five cameras offering a fully calibrated 360 degrees view and two LiDAR profilers with an ultra-light carbon fibre chassis, the multi sensor platform is designed for rapid and regular reality capture. On a crisp Monday morning, we headed to Pancras Square in London to meet the Leica team. After a quick demo of how the kit works, the backpack was put on and we were off surveying – it really was very fast to set up and very simple to operate. 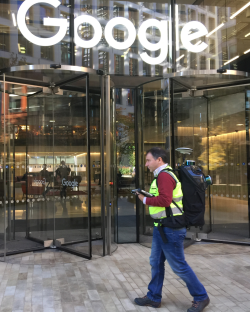 And as it weighs less than 15kg, the team felt that it was a ‘bearable wearable’, offering an efficient way to navigate areas by foot (or by bike) to capture survey data. Overall we all found the Pegasus:Backpack to be a dynamic offering - a fast and flexible solution to fill the gap in surveying areas that the Pegasus:Two system physically can’t reach. With extensive uses also across asset management, BIM modelling and within GIS systems, the platform synchronises imagery and point cloud data, providing the complete documentation of the location surveyed for clients. We are now processing the captured imagery and LiDAR data, keep an eye out for a follow-up blog.